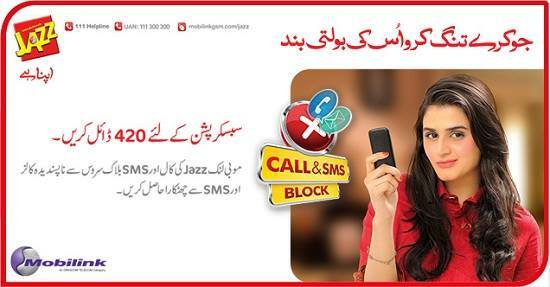 Mobilink brings an exceptional Mobilink Call & SMS Block service for its valued subscribers. Now you can easily block any local number of Pakistan by using it. This is such a reliable feature has launched by this telecommunication side for its valued subscribers of Pakistan and you can easily block any number by using this facility. This telecommunication always care of its valued customers and this feature is one of best example from this network side for its valued customers of Pakistan. This facility is available for prepaid and postpaid customers of this network and both types of consumers can easily avail this service for using without any issue. The charges of this feature are extremely low and all cellular operators who are connected with this network can easily avail this facility in reasonable rates. This service doesn’t only give block facility on same network but you can easily block any network number by using this facility and also PTCL numbers. The details of this feature are mentioned as below. Consumers can activate this facility via dialing service just need to dial *420# and choose the option from menu list. Subscribers can activate this feature through SMS just need type SMS “act ics” and send into 420. Subscribers can also get this facility through IVR just need to dial 420 and follow the instruction. The subscription charges through USSD service are free of cost. The activation charges through SMS are RS 1.2 plus tax. The activation charges through IVR facility are RS 2.39 plus tax per minute. The activation fees through USSD service are free of cost. The activation fees through SMS are RS 1.0 plus tax. The subscription charges through IVR service are RS 2.00 plus tax per minute. The charges of this feature are RS 0.80 plus tax for prepaid consumers for a day. The charges of this feature are RS 20 plus tax for postpaid customers for a month. The validity of this feature for prepaid subscribers is for a day. The validity of this feature for postpaid subscribers is for a month. Consumers can DE-activate via USSD just need to dial *420# and follow the instruction. Subscribers can DE-activate through SMS just need to write SMS “DEACT ICS” and send into 420. Customers can DE-activate through IVR procedure just need to dial 420 then select language and press 2 for UN-subscription. There are no charges for DE-activate this feature. Customers can block any local number of Pakistan. This telecommunication has authority for change incentives and charges at anytime without being informed of subscribers. You may also like it: Mobilink Call Packages.